Review: "Sun Caged: Sun Caged" - Sea of Tranquility - The Web Destination for Progressive Music! Remember the excitement when Dream Theater's Images and Words hit the scene back in the early 90's? 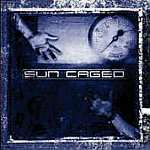 Well, if you were one of those people who went gaga over that album back then, and still consider it to be a classic, I urge you to check out the debut from Dutch progressive metal band Sun Caged. Guitarist Marcel Coenen was formerly with the now defunct Lemur Voice, a very polished band that was on the Magna Carta label. He hooked up with drummer Dennis Leeflang (ex-Within Temptation), bassist Rob van der Loo, keyboard player Joost van den Broek, and singer Andre Vuurboom, forming this raging and intelligent progressive metal band that I predict will create quite a buzz. "Sedation" kicks things off in grand fashion, with upfront heavy guitar riffs and symphonic keyboards. Vocalist Vuurboom is a real find, and he has a powerful, melodic voice that recalls James LaBrie, only he sings more in a mid range. His distinct style lends a classy tone to the otherwise brutal complexity of the title track, which is a prog-metal lovers delight. Coenen displays what a super talent he is on this raging inferno of a song, slaying the listener with intricate rhythms and amazing solos, with drums and bass providing the rock solid foundation. On "Home", Vuurboom opens up with some lovely vocal passages "Yesterday I saw the sun go down and feast his rest, without light I saw him touch the ground and sleep at last, together now we take this trip alone, never ever really leaving home...", then, the acoustic guitars and gentle synths disappear, and crankin' riffs and huge orchestral keyboards come crashing into the mix. Coenen lays down some huge chords and harmonic squeals on this one, sounding like a combination of John Petrucci and Zakk Wylde. The band rampages through the brutal "Soil" with sledgehammer guitar & keyboard riffs, also allowing for some jaw dropping unison lines between Coenen and van den Broek, and powerful vocals from Vuurboom. Keyboardist van den Broek really gets to shine on the melodic and symphonic "Hollow", as he creates a huge wall of sound with piano and synths in addition to ripping off an incredible solo. Vuurboom proves here that he exels on the catchier, melodic pieces just as well as on the raging metal epics. "Closing In" has all the epic prog-metal sounds that you can possibly look for, and knowing that this is a new band you will be amazed at the poise and tightness that Sun Caged show on this one. Gentle piano leads things off before the full band enters the fray, with Leeflang's crashing drums combating for supremacy with Coenens complex riffery. At times on this track I am reminded of Images and Words or Awake era Dream Theater, as the songs mixes melody and intricate arrangements in such a polished and professional manner unlike any other band I have heard in a while. They then slow things down a bit on the doomy "The Eighth Day", complete with big riffs and lots of keyboards, plus a killer chorus. There's so many time changes in the middle of this song, as well as some great little solos from Coenen and van den Broek, that your jaw will be scraping the floor. "Secrets of Flight" might be the heaviest tune on the CD, but still mixes in tons of melody and complexity, which seems to be their trademark. At this point you will probably be worn out from the previous eight tracks, so the band ends things with the beautiful "Unchanging", a song about one persons live that is never evolving. Vuurboom literally soars on this one, backed by van den Broek's gorgeous synths and Coenen's liquid guitar lines. Without a doubt, I have seen the future of prog-metal, and it is Sun Caged. Lion Music has a real find here, and it will be interesting to see how they market them. While the band makes no qualms about showing their influences, they perfectly meld the styles of bands like Dream Theater, Pain of Salvation, and perhaps Symphony X, up the complexity a bit, and add in loads of irresistable melodies. This one's a keeper folks-don't say I didn't tell ya! Even though you may not have heard of Sun Caged before, they're not new-comers! Their amazing guitarist Marcel Coenen has played in various bands, the most important one being the melodic prog metal act Lemur Voice from the Netherlands. They released two albums, both of which were incredible CDs, but disbanded due to poor promo and lack of support. Also, Sun Caged's (new) singer Andre Vuurboom sang in a number of bands (I am familiar with his early-90's band Imperium). The other guys in the band are relatively younger, but incredibly talented!!! Dennis Leeflang, the drummer, is one of the co-founders of the band and despite his young age he is a magnificent drummer! He certainly doesn't fit the typical "prog drummer" category; he has a very laid back sound, entering the songs only when necessary, never going too much over the top. He is also one of the most down to earth and coolest guys I've had the chance to talk to online. He even sent me a copy of their previous EP Dominion a few years ago and it was then that I first realised this band had a lot of potential and would one day hit it big. It took some time till they found their steady line-up and a good record label for a full-length album. And what an album it is! To save you reading from a long and very detailed review, I'll only say this: The self-titled debut album from Sun Caged is one of the best prog metal albums of 2003, possibly my favourite! For those of you who have heard the Dominion EP with former singer Sascha and their Dream Theater cover tune "Caught In A Web" with a female singer, be prepared for a more prog-driven Sun Caged on this CD. Their new singer Andre is more in the league of singers like Ray Alder, Geoff Tate, and a younger James Labrie, whereas Sascha was more of a Mercury/Dickinson type of singer. The rhythm work, both in Marcel's guitars and Rob's bass, is very reminiscent of Meshuggah, who is obviously a big influence of the band. Marcel Coenen's talent needs no explanation. He is a real guitar freak! I really like the articulation in his playing, very technical with some killer runs on the fretboard and unbelievable sweeping. The bass work is really crunchy, very prominent, very solid. Sun Caged seems to put emphasis on their rhythm work very much and the result is marvelous. It would be pointless to liken the sound of the band to others, but I will still mention the monumental Fates Warning, I&W-era Dream Theater, the instrumental wizardy of Liquid Tension Experiment, the technical craziness of Meshuggah, the perfectly balanced song arrangements of Ayreon, and the jazzy touch of Cynic lest you get (part of) the picture. Now think of a band that combines all these elements with their own identity and puts out a very dense, poignant, and progressive release. That's the sound of Sun Caged. A truly talented band with a very promising future. I don't know how they are going to top this one, but if they could create this one, they could even create something that surpasses it. The mastermind behind Ayreon and Star One, Arjen Lucassen, mixed this CD. So if anyone has ever listened to an Ayreon disc, they will know that this album sound-wise is perfect. Please note that this is the first CD Lucassen has ever mixed. He probably thought that a great record like this needed to be recorded accordingly. The dynamics of the album are flawless, there's a wide range of sounds, very detailed and precise. The first couple of times vocalist Andre reminded me of a younger Labrie, however with each listen I was more and more drawn to the Tate/Alder comparisons. He sings the upper registers effectively and effortlessly, though he doesn't necessarily tend to show off his range every opportunity he gets. That's something I really admire. Marcel Coenen, too, despite his rich vocabulary on his guitar, only shreds if the song calls for it. The melodic and fiery guitar solo in the title track is one of the most shocking and beautiful solos I've heard in a long time. I also love the chorus in this track. "Sedation" borrows some LTE elements and the song is quite representative of Sun Caged's style displaying various elements in their music. "Closing In" and "The Eighth Day" feature some killer rolls and fills from Dennis. I would have loved to hear more of those. Each song offers all the musicians plenty of room to prove they're masters of their instruments, but it's always meticulously done within the context of the song. Very mature. The keyboards are a cross between Moore era DT/LTE. Joost both adds atmosphere and sharp keyboard solos from time to time. He is not too high in the mix, but his presence is always felt heavily. 2003 has been a bad year in terms of prog metal. Dream Theater's new album was practically the only thing that caught progheads' attention, and it's been getting lots of mixed reviews. (Redemption is another release that comes to mind.) Here is your chance to hear something different. Far heavier and technical than the average prog albums coming out these days. Pick it up and hear for yourself.